Image reproduced with kind permission of LHC. Boyle+Summers were creative in identifying a wide range of distinctive commercial opportunities, as well as the landscape and urban design principles that would guide their implementation. Great energy and innovation was shown in the formulation of those ideas, and technically work was of a very high standard. In order to help conserve, improve and invest in Poole’s five kilometres of premier natural beaches, the Borough of Poole asked us to prepare a master plan that built upon their Seafront Beaches Strategy. From Sandbanks in the west to Branksome in the east, the beaches popularity and commercial attractiveness reflect their variable accessibility and profile. All the beaches are distant from the town centre, and face the vagaries of the weather, and one aim was to improve their year-round appeal. – Investing in the ageing infrastructure, such as drainage and toilets, to ensure the preservation of core services. 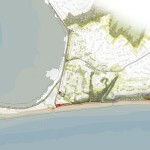 Working with Goadsby, PH Warr, Buro Happold and Bournemouth University we produced strategies for the beaches as a whole, and a series of proposals for each beach. The latter was largely influenced by accessibility and the space available for change. On this basis the car park, beach huts and promenade at Sandbanks represented the greatest opportunity, albeit that it was constrained by legal covenants and ecological sensitivities. The master plan, entitled Sustaining Poole’s Seafront, was adopted as a Supplementary Planning Document in Autumn 2015.